Peck’s is owned by Matt & Michelle Pecoraro & was opened in September of 2004. 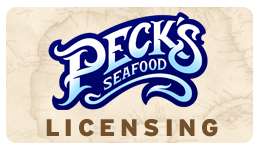 Peck’s started as a fresh seafood market & has become a full service restaurant. Our menu reflects our ongoing passion for the freshest & highest quality ingredients & products. Staying true to our roots, we are committed to only purchasing fresh, locally produced seafood. While prices sometimes fluctuate due to the current market, we promise to never sacrifice quality or value due to cost. 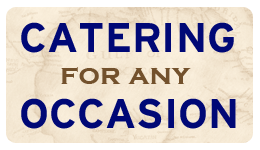 Let us CATER your next event! Whether big, small, in-house, or off-site, Peck's has you covered with amazing food for any event. You'll really impress if you have us cater your next Crawfish Boil or Tailgate party. GIFT CARDS make a wonderful present for Stocking Stuffers, Birthdays, Anniversaries, Graduations, Thank You Gifts, Date-Night Treats, or Business Gift. 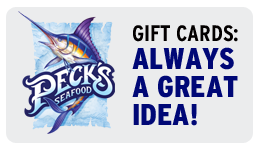 Treat the people in your life to the GIFT of GREAT TASTE from Peck's! Do you love Peck’s? Would you like to own a Peck’s of your own? We’re currently seeking motivated entrepreneurs, who would like to work with us to expand the Peck’s restaurant experience to new locations.